Scary Monsters magazine #88 - Teenagers From Outer Space! 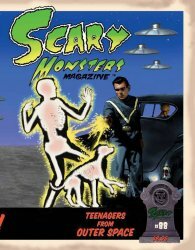 MyMovieMonsters.com > Scary Monsters Magazine > Scary Monsters 1-100 > Scary Monsters magazine #88 - Teenagers From Outer Space! It's an Alien Threat, Monster Attack, Under the Gun, Ray Gun Rampage! Scary Monsters magazine #88. Another huge 164-page issue for true classic horror/sci-fi fans! Congratulations to Publisher & Editor in Chief Dennis Druktenis and the rest of the Scary gang for winning the 2012 Rondo Award for Best Classic Magazine! Monster Fest 9 was Extremely Fine! Shock Theater Horror Hosts Unearthed: Dr. Ghoulman and Professor Headstone Rise Again! Collectors Note: Actual magazine has barcode on lower left-hand corner of magazine.